Mangal (Arabic: منقل‎, translit. manqal‎, Turkish: mangal, Persian: منقل‎, translit. manghal‎, Hebrew: מנגל‎, translit. 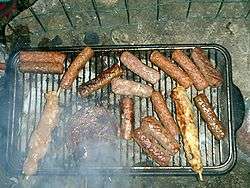 manghal‎, Georgian: მაყალი, Armenian: Մանղալ, Azerbaijani: manqal, Russian: мангал) is the Middle Eastern name for barbecue and refers to both the event and the grilling apparatus itself. The word mangal is Turkish, derived from the Arabic word manqal (منقل) meaning "portable" and originally referred to portable indoors heaters mostly replaced by Western-type stoves. A mangal is typically used to grill various cuts of meat, such as steak, hamburgers, kebab, shashlik, chicken wings and chicken breasts. Roasted vegetables, salads and other cold foods accompany the meal. In Turkey, şalgam or ayran are common drinks during mangal parties as well as rakı. Mangal also refers to the social gathering of family or friends in gardens or picnic areas, similar to the South African braai. In Israel, holding a mangal is traditional on Israel Independence Day and the intermediate days of Passover.